Are you visiting Apenheul with a group? Groups of 20 people or more receive a € 2.50 additional discount per person on the price of their entrance ticket, either at the counter or on our webshop. Thinking of organising something special for a family occasion, outing with your sports club or staff party? Apenheul’s the place! Do you want to enjoy a tasty and honest cup of coffee, lunch, drinks or dinner together? Then choose one of our luxury packages! The possibilities are endless and very much out of the ordinary. We’ll make your day at Apenheul complete! Contact us and ask about the possibilities. At Apenheul, you can drink amazing tasting and totally honest coffee from very our own coffee project in Peru. At Apenheul, you can drink amazing tasting and totally honest coffee from very our own coffee project in Peru. By drinking this coffee, you are contributing to the protection of Peru’s cloud forest and the primates that live there! Sustainability is very important at Apenheul, which is why we choose our products carefully, without losing sight of quality. Gluten or lactose-free? Of course we can happily cater to your dietary requirements. Apenheul offers a range of unique and attractive accommodation for groups of 10 to 900 people. Our primate park is also an official wedding venue. Kambizuri offers all the modern comforts. Kambizuri is a very special place. Groups of up to 150 people can take place in the cosy lodges with a view of the gorilla island. Kambizuri offers all the modern comforts. A reception, lunch or presentation here will give your guests a fantastic feeling with that extra bit of je ne sais quoi. 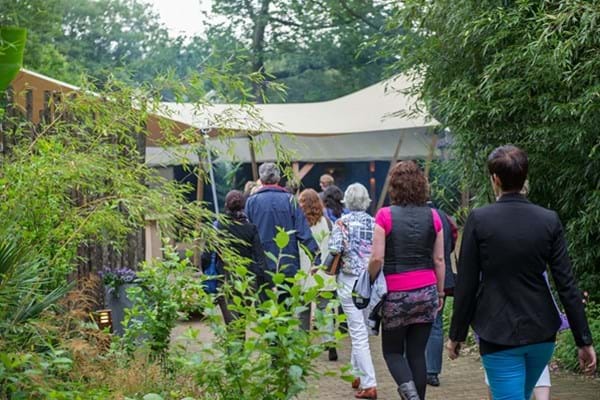 De St@art is a beautiful, sustainable venue with an auditorium for 300 people, various meeting rooms and a covered, outdoor terrace – great to combine with a visit to our primate park! De St@art is open to groups all year round. Heat is stored in the ground in order to heat the building in colder weather. The floor covering is made of recycled jeans and car tyres. De St@art is CO2 neutral. The coffee we serve is from our own coffee project in Peru. All our guests’ car miles are offset with sugar palm projects in Indonesia. Our park offers even more unique opportunities for groups. How about cosy drink in an Indonesian village on stilts? You can give presentations for groups of up to 900 people at the Bongo Bonde, the gorilla feeding place. You’ll really get to see the primates’ individual personalities shine on a guided tour through Apenheul. Our specially-trained, enthusiastic guides will tell you everything you want to know about Apenheul’s inhabitants and their counterparts in the wild. The expert guide will also comment on topical current events. * Check out our offers here.